I’m not completely sure why this error is generated, but I have a hunch it’s because CutePDF tries to use a list of already installed PostScript print drivers and if none of the pre-configured ones are found, it errors out and will not continue. Install CutePDF Writer and allow it to error out. Make sure you select to install the PS2PDF tool when it asks. For driver you’ll need to find a PostScript compatible driver. I went to the HP drivers and selected the HP Color LaserJet 2500 PS driver. The PS at the end represents that it is a PostScript driver. You may have to look in the list, but there should be plenty of PostScript compatible HP drivers you can pick from. On the Ports tab, change the port to CPW2: (CutePDF Writer). Do a test print. If you choose CutePDF (or whatever you named it) you should be prompted with a dialogue box asking where you’d like to save the PDF. Now there’s many ways to do this. Some of these include online converters, programs, and plugins for Word. 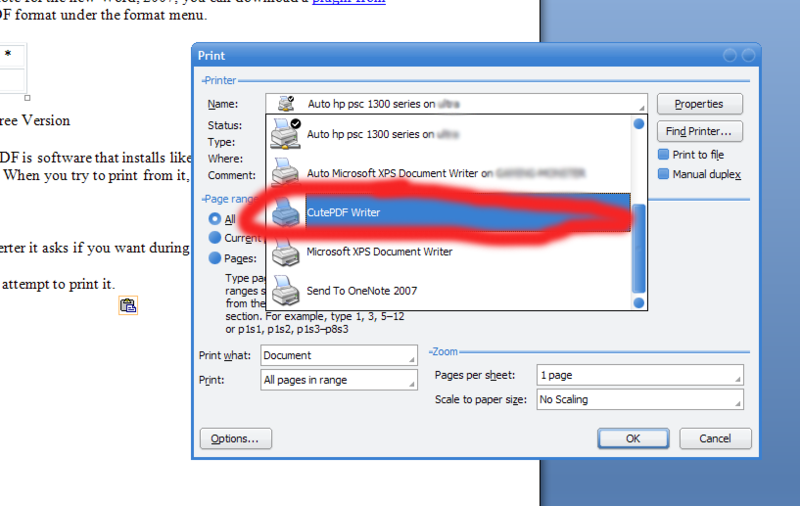 Please note for the new Word, 2007, you can download a plugin from Microsoft that adds the PDF format under the format menu. a. Program Info: CutePDF is software that installs like a printer. CutePDF will show up under printers and fax machines. When you try to print from it, it allows you to save a PDF. a. Also install the converter it asks if you want during installation. 3. Open the document and attempt to print it. 4. Hit the printer drop down list and select the new CutePDF Printer. 5. Configure the settings like you normally would and hit OK to print. 6. A Dialog box should come up asking for a name and place to save the file. Select the name and place and hit OK.
*7. For large files a box may appear with a progress bar. Just wait while it prints.